Mouse anti Human Laminin Alpha 2 antibody, clone 5H2 (6067-0906) used for the immunopurification of laminin alpha-2 from human placenta for coating culture vessels prior to plating of airway smooth muscle cells. Phase contrast images of ASM cells in the presence and absence of different coating of laminin isoforms following 7-day serum deprivation. EHS = laminin from Engelbreth-Holm-Swarm murine sarcoma; β1 = affinity purified β1 chain-containing laminin from human placenta that includes LN-1, 2, 6, 8, 10; α2 = affinity purified α2 chain-containing laminin from human placenta that includes LN-2 and 4. Bar = 70 μm. From: Tran T, McNeill KD, Gerthoffer WT, Unruh H, Halayko AJ. 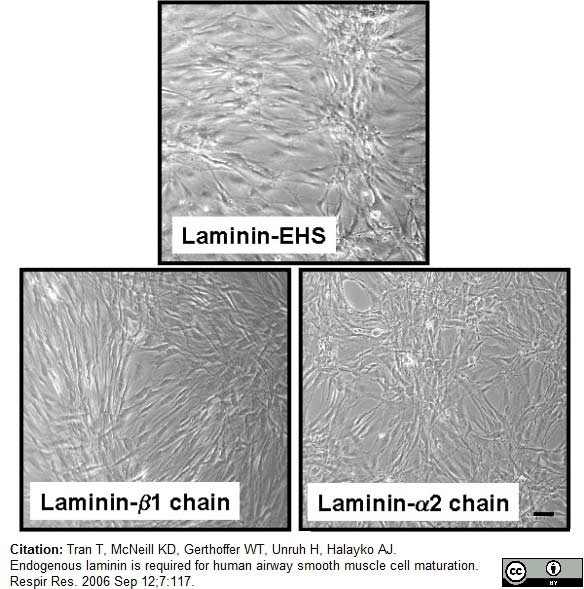 Endogenous laminin is required for human airway smooth muscle cell maturation. Respir Res. 2006 Sep 12;7:117. Mouse anti Human Laminin Alpha 2 antibody, clone 5H2 (6067-0906) used for the evaluation of laminin alpha-2 expression in cultured human airway smooth muscle cells by western blotting. Western blot analysis showing the protein abundance of laminin chains at Day 0 (open bars) and following 7-day serum deprivation (closed bars).  P<0.05, compared with the respective laminin chain at Day 0. 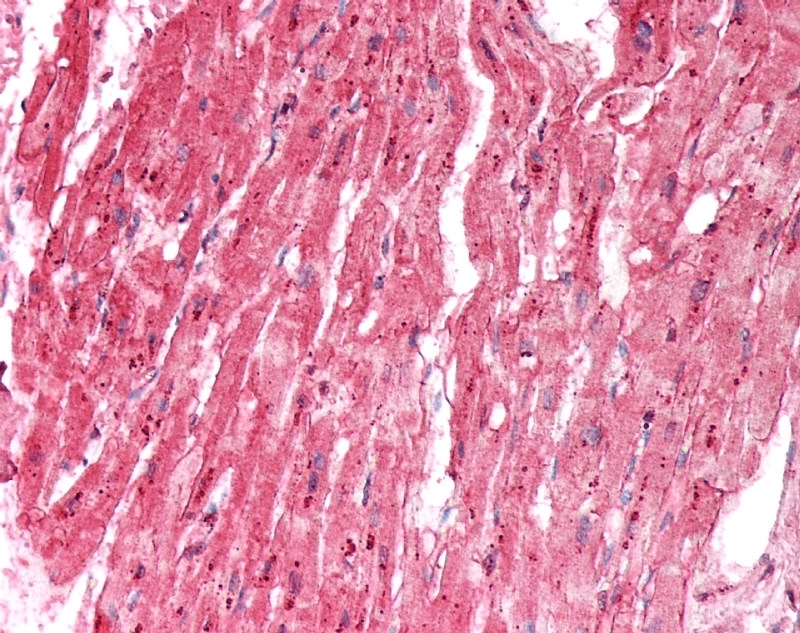 FFPE human heart stained with Mouse Anti-Human Laminin Alpha 2 (6067-0906), biotinylated Anti-Mouse IgG and Streptavidin Alkaline Phosphatase (red). Nuclei were counterstained with hematoxylin. 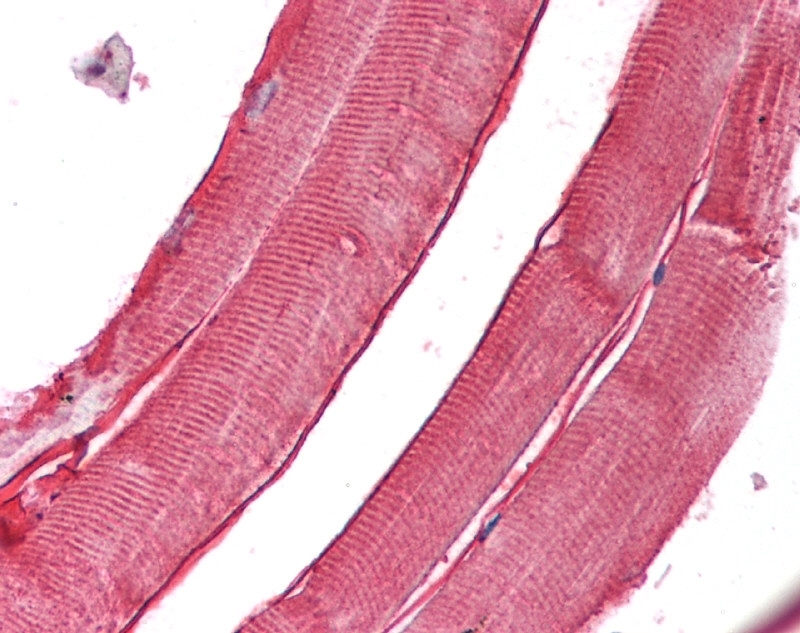 FFPE human skeletal muscle stained with Mouse Anti-Human Laminin Alpha 2 (6067-0906), biotinylated Anti-Mouse IgG and Streptavidin Alkaline Phosphatase (red). Nuclei were counterstained with hematoxylin. Mouse anti Human laminin alpha 2 antibody, clone 5H2 recognizes the ~80 kDa fragment of laminin subunit alpha-2, also known as the laminin M chain, laminin-12 subunit alpha, laminin-2 subunit alpha, laminin-4 subunit alpha or merosin heavy chain. Laminins are trimeric basement glycoproteins consisting of three non-identical multi-domain chains (alpha, beta and gamma) each encoded by a distinct gene. The alpha-2 chain is a subunit of Laminin-2 and Laminin-4, widely expressed in the basement membrane of skeletal muscle and peripheral nerves. Laminins are thought to mediate cell attachment, migration, proliferation and differentiation with other extracellular matrix components. Mutation of the LAMA2 gene can lead to the development of Merosin-deficient congenital muscular dystrophy 1A (MDC1A), a condition characterized by hypotonia, proximal weakness, hyporeflexia and difficulty walking (Tazek et al. 2003). 1Acetone is recommended. 8 µm fixed cryostat muscle sections have been used, with an HRP conjugated secondary antibody for detection. Sewry, C.A. et al. (1995) Expression of laminin subunits in human fetal skeletal muscle. Histochem J. 27 (7): 497-504. Engvall, E. et al. (1990) Distribution and isolation of four laminin variants; tissue restricted distribution of heterotrimers assembled from five different subunits. Cell Regul. 1 (10): 731-40. Tan, E. et al. (1997) Late onset muscular dystrophy with cerebral white matter changes due to partial merosin deficiency. Neuromuscul Disord. 7 (2): 85-9. Awamura, Y. et al. (2008) Long-term follow-up of laminin alpha2 (merosin)-deficient muscular dystrophy in a cat. J Feline Med Surg. 10 (3): 274-9. Eriksson, A. et al. (2005) Skeletal muscle morphology in power-lifters with and without anabolic steroids. Histochem Cell Biol. 124 (2): 167-75. Guo, L.T. et al. (2003) Laminin alpha2 deficiency and muscular dystrophy; genotype-phenotype correlation in mutant mice. Neuromuscul Disord. 13 (3): 207-15. Kjellgren, D. et al. (2004) Laminin isoforms in human extraocular muscles. Invest Ophthalmol Vis Sci. 45 (12): 4233-9. Li, J. et al. (2006) Overexpression of laminin-8 in human dermal microvascular endothelial cells promotes angiogenesis-related functions. J Invest Dermatol. 126 (2): 432-40. Marinkovich, M.P. et al. (1992) The dermal-epidermal junction of human skin contains a novel laminin variant. J Cell Biol. 119 (3): 695-703. Nakano, J. et al. (2005) Laminin-induced autoimmune myositis in rats. J Neuropathol Exp Neurol. 64 (9): 790-6. O'Brien DP et al. (2001) Laminin alpha 2 (merosin)-deficient muscular dystrophy and demyelinating neuropathy in two cats. J Neurol Sci. 189 (1-2): 37-43. Tian, M. et al. (1997) Laminin-alpha2 chain-like antigens in CNS dendritic spines. Brain Res. 764 (1-2): 28-38. Tran, T. et al. 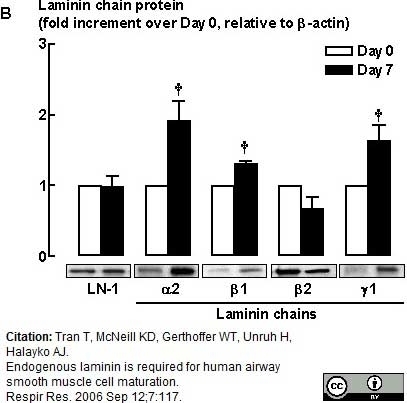 (2006) Endogenous laminin is required for human airway smooth muscle cell maturation. Vainionpää, N. et al. (2007) Basement membrane protein distribution in LYVE-1-immunoreactive lymphatic vessels of normal tissues and ovarian carcinomas. Cell Tissue Res. 328 (2): 317-28. Vuoristo, S. et al. (2009) Laminin isoforms in human embryonic stem cells: synthesis, receptor usage and growth support. J Cell Mol Med. 13 (8B): 2622-33. Alhamidi, M. et al. (2017) Limb Girdle Muscular Dystrophy type 2I: The clinical variability seen in patients homozygous for the common FKRP (c.826C>A) mutation does not correlate with histopathological alterations, levels of glycosylated α-dystroglycan or laminin α2 in vastus lateralis.